We believe trust between strangers is essential and possible. Our clients expect that we unleash global access to rare value, veracity and new liquidity in all their transactions. Upptäckare is the Swedish word for individuals who forge new paths and make epic discoveries together. Our path and Blockchain platform is how we collaborate with our clients to find, verify, store, secure, and transfer truly valuable assets at lower costs and higher value. 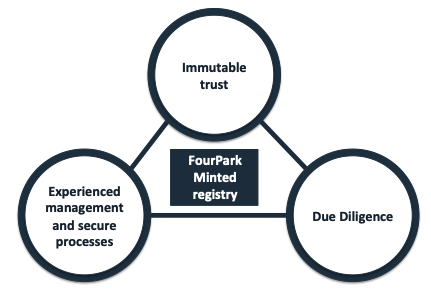 FourPark Minted, LLC creates new liquidity in valuable assets. Fundamentally, the combination of FourPark’s unique capabilities, 8-step process and groundbreaking Blockchain technology allows for transparent and safe transactions between strangers through an immutable ledger. Through its association with FourPark Advisors, a registered investment advisor, FourPark Minted also offers fully SEC compliant token offerings.